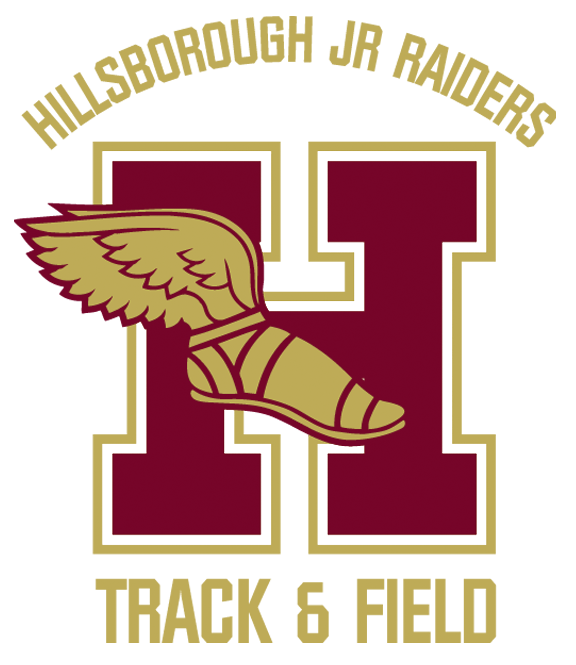 The Hillsborough JR Raiders Track program offers an introduction to the sport of Track and Field to boys and girls grades 2 through 8. Our goal is to provide a safe and fun learning environment for the young athletes while challenging them to become the best they can be. The athletes are split into age groups and compete based upon their birth year (sub bantam (under 9), bantam (9-10), midget (11-12), and youth (13-14). Please see the USATF site for reference. We schedule at least three internal track meets, meaning we compete only against athletes from our program. We also attend meets hosted by others programs in the area, and compete in the Skylands Track and Field Championships at the end of the season. While we feel that competing in meets is an important part of the program, we respect that some children might not want to. However, the local meets with other clubs in the area are a little more competitive yet still fun for athletes on all skill levels. When possible, we will attend track meets that are free. However, some meets will impose an event fee or a flat fee ($10–$25) for the day. You are responsible for this fee and any fees to join USATF or other Track and Field organizations. We will be offering training and competition in the following events: running events (55, 100, 200, 400, 800, 1500 meters) and field events (hurdles, shot put, discus, javelin, long jump). Depending on the abilities of our athletes, we reserve the right to limit or add events. Events that are typically age dependent (10 and under) include hurdles, shot put, discus and javelin. Not all events will be taught every day based on the number of athletes and coaches involved, facilities, and equipment. Those athletes who are serious in competing at a higher level are coached towards competing in USATF Track and Field meets. USATF competes on a District, Regional and National level. We have several athletes compete successfully on the all Levels in the last few years! The program begins around March 28th, and continues through early June. Practices will NORMALLY be on Tuesday and Thursday evenings from 6:00 – 7:30pm at Auten Road School, and Saturday afternoons at the Hillsborough High School Track (track times might vary during season). However, Jr Raider Track program is working closely with the High School athletic director to have more practices at the high school track. Therefore, some practices may be on different days of the week with varying times. Once the schedule is finalized, it will be posted on the website. We realize that families have busy lives, and the athletes have other activities that may interfere with attending track practice. We are a very flexible program, and we do not penalize those who miss practice. You do not have to notify the director if you cannot attend unless it is a long-term absence or an injury. We will practice in light rain showers and cold weather. Appropriate dress is always sweat pants and top over running shorts and tee or athletic shirt regardless of temperature. If it’s cold wool hats and gloves are fine. Keep your athlete warm and happy. They can always remove sweats when the weather improves and it’s time for their running events. It is important to understand that the programs’ goals are to teach the fundamentals and skills of Track and Field. Our numbers have grown to over 200 athletes for the last two years. While the coaches are dedicated to teaching everyone to help them achieve their goals, we ask each parent to have a discussion with their children about attitude and effort before the season begins. It is unfair to the coaches and other athletes who are distracted by others fooling around and not paying attention. Additionally, we will not accept bullying of any type. There are many moving parts to practice and meets including throwing items, fast running and jumping which can injury the athlete or those causing a distraction. The Track Program reserves the right to remove any athlete from the program that is not behaving appropriately. - Unlimited fun with friends! Registration and payment is online at www.jrraiders.org. Please go to our website at www.jrraiders.org and click on “Registration” and follow instructions for Track.